2. E-learning documents – Where are we and what to do in the future? CTIF Fire Prevention Commission will hold our annual meeting where we discuss fire prevention issues related to fire brigades and general population. The 2015 meeting will be in Boston, US from May 13 to May 15. This year our key issues will focus on fire risks and households active fire protection systems. Our hosts this year are NFPA and FM. * examine fire safety and safety solutions for large single story storage buildings. * analyze the security of operative staff working circumstances and safety. * to analyze instructions, regulations, laws and decrees about fire safety as well as the security culture prevailing. One of the Fire Prevention Commission's goals is to reduce fire deaths and casualties. 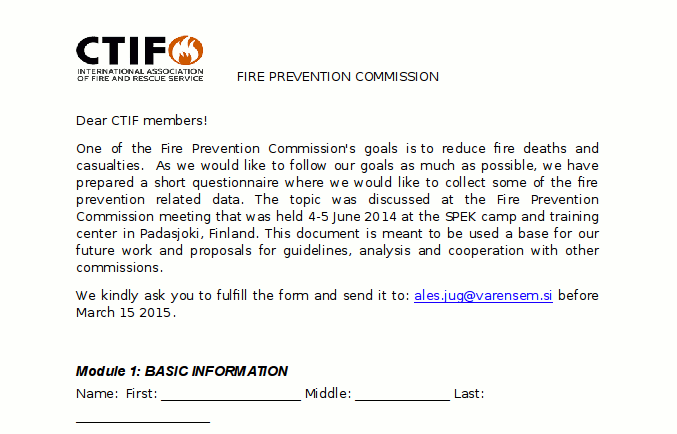 As we would like to follow our goals as much as possible, we have prepared a short questionnaire where we would like to collect some of the fire prevention related data. 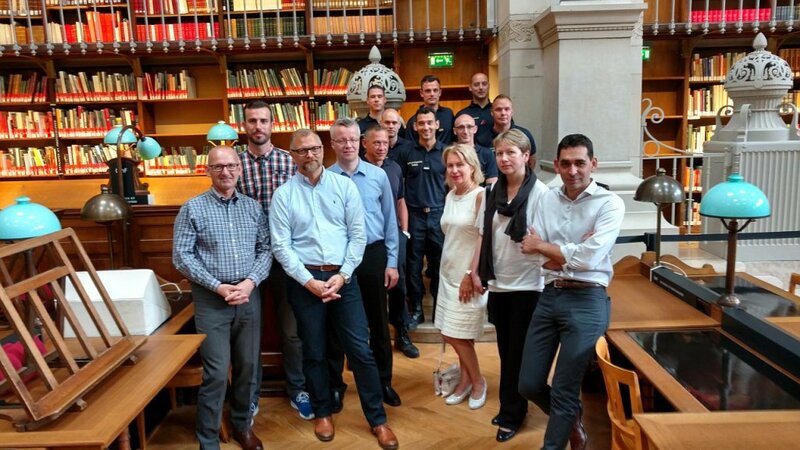 The topic was discussed at the Fire Prevention Commission meeting that was held 4-5 June 2014 at the SPEK camp and training center in Padasjoki, Finland. This document is meant to be used a base for our future work and proposals for guidelines, analysis and cooperation with other commissions. We kindly ask you to fulfill the form and send it to: ales.jug@varensem.si before March 15 2015. The CTIF Fire prevention commission was founded in 2001 in order to promote fire prevention activities among the CTIF community and wider. One of the mayor commission goals is to examine fire safety in building, analyze general fire safety rules, regulations and codes and promote fire safety culture in order to reduce fire deaths, injuries and fire damages. 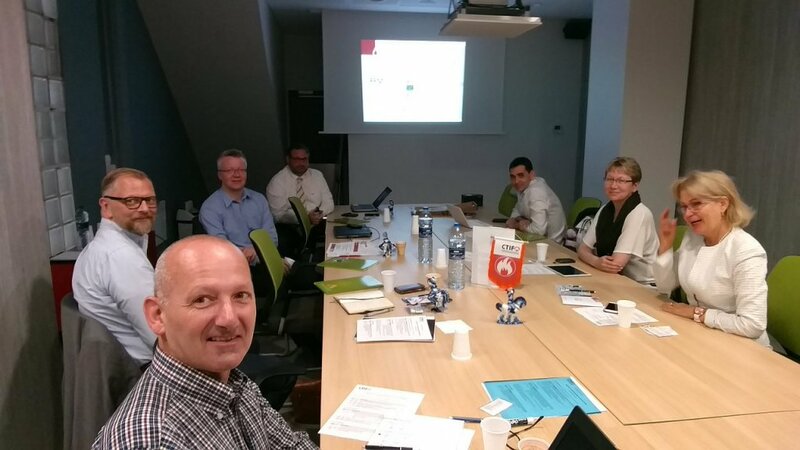 The CTIF Fire prevention commission is trying to encourage and promote the cooperation between fire services, fire prevention associations, insurances and governmental bodies around the world, representing 36 different countries via CTIF. At the moment Fire prevention commission is working on two guidelines. First one is about carbon monoxide risks and prevention measures in relation to firefighter’s activities and building occupants. Second guideline deals with fire evacuation drills and recommendations for building owners. 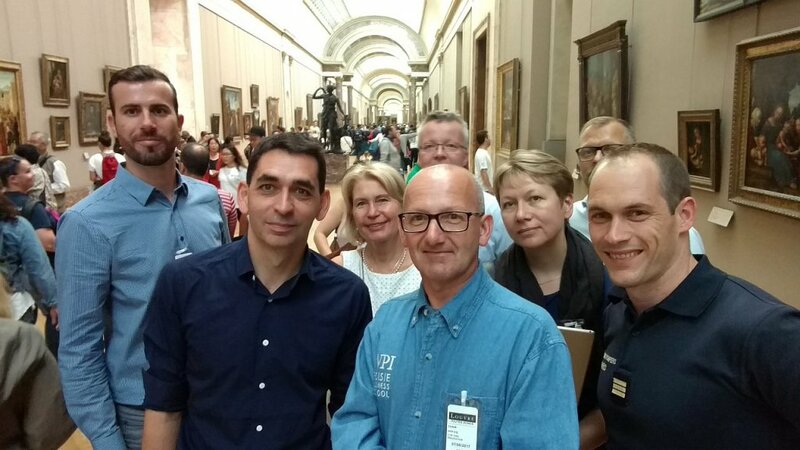 Commission meeting scheduled for June 2014 will focus on guidelines, fire risk assessments, fire investigations and fire risks related to EPF facades. In all subjects the commission wants to focus primarily on risks and fire prevention measures. As we would like to have additional suggestions, ideas and proposals for our activities, you are invited to attend a meeting. Please do not hesitate to contact me if you have any further questions. Attached you’ll find meeting agenda, short info about the meeting place and meeting organization and meeting attendance questionnaire. Minutes of Fire Prevention commission meeting, held from 18.6.2013 to 19.6.2013 in Fjelldal, Norway.